Becky grew up playing sports in Cherry Hill, NJ. After completing her BA at the University of North Carolina in Wilmington, NC, she began a career in golf. Currently, Becky is one of only 200 dual LPGA/PGA members. She obtained her LPGA master status after writing a thesis, which was later published in the Journal of Applied Golf Research and has also served in many capacities within the LPGA and received a proclamation for her many contributions. She has published many articles and presented as a speaker. Throughout her career, Rebecca Dengler has been recognized by numerous golfing organizations, publications, and by her colleagues for her positive, innovative teaching style. Most recently, Rebecca was named to Golf Digest’s inaugural ranking of the 50 Best Women Teachers in America. She was also named by the LPGA as one of the country’s 50 Top Teachers for 2008-09. More than 1200 teaching professionals around the country voted to compile this list. In 2007-2008 Becky was named the #1 Teacher in the State of Delaware by Golf Digest Magazine. She has also been named a top teacher by Golf for Women and Golf Magazine. In 2010 she was included in the US Kids Top 50 Teachers list for her third time, and then as one of the US Kids Master Teachers. Becky was a program coordinator for the urban youth golf program of Delaware, which has since become the 1st Tee of Delaware. She now serves as a consultant for the 1st Tee and is also a certified 1st Tee coach. She has contributed to many charities and established a scholarship for junior golfers, which raised over $100,000. 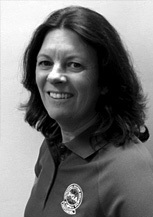 Becky has been the Teaching Professional at Ed Oliver Golf Club since 1992.